Monitoring System 400 - This new monitoring device is the entry solution of the High End IT monitoring appliances from Didactum. 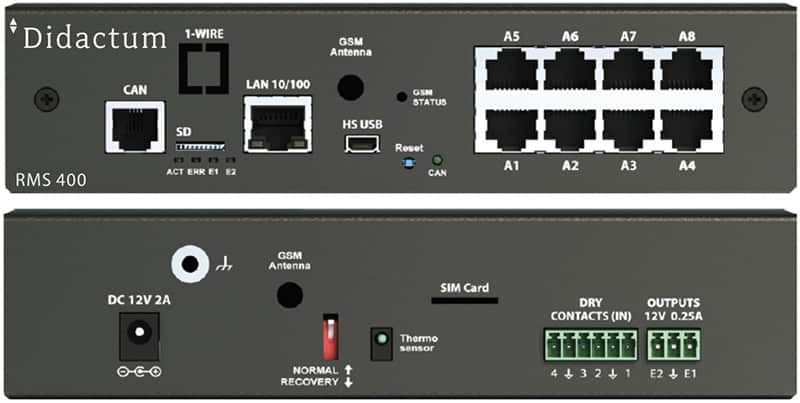 Additional Text: Monitoring System 400 - This new monitoring device is the entry solution of the High End IT monitoring appliances from Didactum. Product information "Monitoring System 400"
This monitoring device represents the latest model of Didactum`s IP-based remote measuring and alarm systems. This Remote Monitoring System (RMS) is an appliance, a combination of advanced hardware and software architecture. The engineering and support of the Didactum monitoring and alarm systems are located in Germany. Production takes place within the EU. This Ethernet-based surveillance solution is suitable for companies and public institutions (in almost all sectors). It is used where physical or man-made risks must be detected and reported as early as possible. Reduce unplanned downtime and production losses with this monitoring unit. The Remote Monitoring System 400 is Ethernet enabled - access this innovative monitoring system from anywhere. Also ideal for remote monitoring of branch offices and remote engineering locations. 1x temperature sensor included (up to 100 meters extendable) and many more …. The engineers from manufacturer Didactum know that every every warehouse, every telecom site and every server room or data center is different. Based on the modular principle, each Remote Monitoring System (RMS) can be equipped with individually selectable intelligent sensors. Get a customized remote monitoring solution for non-stop protection of your mission-critical infrastructure. The main unit has 8 ports for Didactum`s intelligent sensors. By auto-identification, every intelligent sensor connected to the Remote Monitoring System is automatically detected and immediately displayed in the multilingual web interface. Here individual limits and thresholds ​​can be defined for each sensor. Set upper and lower thresholds for temperature monitoring. Afterwards, notifications, alarms and actuator functions can be easily defined in the integrated logics of the remote monitoring device. Define, for example, that in the event of a critical overheating, the technicians will be alerted by SMS (* via GSM modem or 3rd party email to SMS gateway) and the responsible administrators by e-mail. Optionally, the loud siren with built-in flashing light can also signal the critical event. The manufacturer Didactum offers a large selection of intelligent sensors for the 400 remote monitoring and alarm system. The product range is subdivided into environmental monitoring sensors, power monitoring sensors, and security monitoring sensors. Measure and control critical environmental conditions such as temperature, dew point, relative humidity (rH) or airflow with this innovative SNMP-enabled remote monitoring unit. The escape of moisture or water-containing liquids can be detected reliably with the Didactum water sensor. For leak detection in larger (IT) infrastructure, water leakage cables in lengths of up to 50 meters (or even longer) are offered. Smoldering fires or open fires can be early detected by using Didactum`s networked smoke detectors. Remember that a fire in the electrical box or control cabinet can affect your entire company. Therefore, smoke detectors should also be installed there. Glass break, motion and magnetic door contacts intensify the security of your infrastructure. The DC and AC sensors from manufacturer Didactum support the precise measurement and monitoring of current and voltage. For example, measure and monitor the power consumption of existing network or server cabinets. By installing AC AC sensors in mission-critical production and storage facilities, a potential power outage can be early detected and reported to the technicians immediately. Already existing sensors or sensors from third-party manufacturers, such as CO2 sensors, (differential) pressure sensors, etc., can also be integrated into the IP-based remote control system with the support of optionally available transducers. On the back of your Didactum 400 remote monitoring unit are 4 digital inputs for the connection of door switches and dry contacts. Two 12V outputs allow the connection of alarm sirens or door locking systems. The digital / floating contacts connected to the Remote Monitoring System are configured via the multilingual web interface. Insert e.g. individual notifications, alarms and actuator functions for the connected UPS or air conditioning system. Via SNMP command, the respective switching state of the dry contact can also be interrogated and controlled remotely. The sensor data measured in real time is stored in the data logger of the Didactum 400 monitoring device. The capacity of the data logger can even be conveniently expanded with an optional USB memory stick up to 64GB. You can check the recorded temperature data from the last few minutes, days, weeks or months directly in the web interface. Determine if the temperature specifications have been met. For checklists and reports, the sensor data can be conveniently downloaded in XML or CSV file format and edited, for example, with MS-Excel. The measured data recorded by the Remote Monitoring System 400 can be also used for audits. In the syslog event database, all occurred events are stored. The syslog can be sent at regular intervals directly to the headquarters and analyzed and evaluated from there. A built-in alarm map helps you and your colleagues quickly to locate threats. If the IP-capable smoke detector triggers an alert it will be displayed on the built-in alarm map. 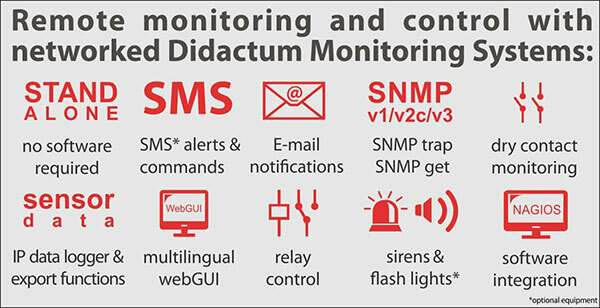 Didactum`s 400 remote monitoring device supports the SNMP protocols v1, v2c and v3 (encrypted). SNMP MIB files for Network Monitoring Software (NMS) and plugins for Nagios are supplied free of charge, so that nothing stands in the way of a quick integration of the monitoring hardware and the intelligent IP sensors from Didactum. The sensor data collected by the IP-based monitoring unit in real time can be transmitted directly to network and building management software. The digital alarm contacts of machines and systems connected to Didactum main unit can also be monitored by the central management software. Installing the Remote Monitoring System 400 is straightforward. An integrated assistant in the web frontend guides you through all important settings of this networked remote monitoring and alerting device. The built-in logic supports a user-friendly creation of notifications and alarms. The Didactum monitoring system 400 is scalable, so simply add sensor expansion boxes to increase the total number of smart sensors. Thus, other mission-critical rooms and facilities can be eadily integrated into the non-stop monitoring of the Remote Monitoring System 400. Expansion units with up to 64 inputs for potential-free / dry contacts contacts are also available. Related links to "Monitoring System 400"
Didactum Sensor Temperature: Didactum Sensor Temperature, 4-wired patch cable RJ11 (2m), screw, double sided mounting tape. Customer evaluation for "Monitoring System 400"
Fully customizable monitoring system. This unit meets our requirements.